Located in peaceful, rural Islamlar, three-bedroomed Koy Manzara offers a relaxing stay with excellent links to the village and coastline. Sitting pretty on the hillside above Kalkan. Located in peaceful, rural Islamlar, three-bedroomed Koy Manzara offers a relaxing stay with excellent links to the village and coastline. Sitting pretty on the hillside above Kalkan, the villa has breath-taking views of the Patara bay and tree-lined countryside. Spend hours relaxing by the pool with a book, sipping local wines on the terrace or enjoying a siesta in your spacious bedroom. The three double bedrooms are decorated in a modern style that incorporates natural-coloured materials like white-wood furniture. Whitewashed walls and floor-to-ceiling windows make the rooms feel light, while the en-suite shower rooms are adorned in marble tiles and have sleek stainless steel features. The rooms all have access to the outdoor lounger-lined terrace and gardens. The generously sized swimming pool is undoubtedly one of the focal points at Koy Manzara, and there's plenty of places for you to put your feet up in the sun or the shade. With a barbecue and dining area for al fresco lunches too – and the option of a chef service for an added leisurely touch – meals time here are a luxurious affair that let you take in the exquisite views and quiet atmosphere. Designed to offer contemporary style and comfort, the single-storey villa is fully air-conditioned and also has an open-plan kitchen and living room which opens onto the terrace. The kitchen is equipped with mod cons like a washing machine, microwave and oven for a hassle-free home-from-home stay. For picking up fresh local produce, you're only a two-minute stroll from local shops and 9km from central amenities in Kalkan. For when you'd like to dine out instead, it's a leisurely five-minute stroll to traditional eateries in Islamlar where you can try local cuisine. The villa is surrounded by a thousand square metres of natural grounds and is sea facing, making its rural setting innately private and secluded. If you'd like to explore, the sand and pebble beach of Kalkan is only 9km away, and you're 17km from Patara's sandy bay and impressive ancient ruins. This stunning part of Turkey is steeped in traditional culture and untouched by mass tourism. Turkey's southern Turquoise coast is a treasure trove of sights: lively Kalkan town with waterfront restaurants and a boat-filled harbour, Patara beach with unspoilt sand and extensive Lycian ruins and the majestic pine tree-lined Taurus mountains. In Kalkan, get lost amid the colourful backstreets and explore the whitewashed houses, cobbled streets and alleyways leading down to the harbour. 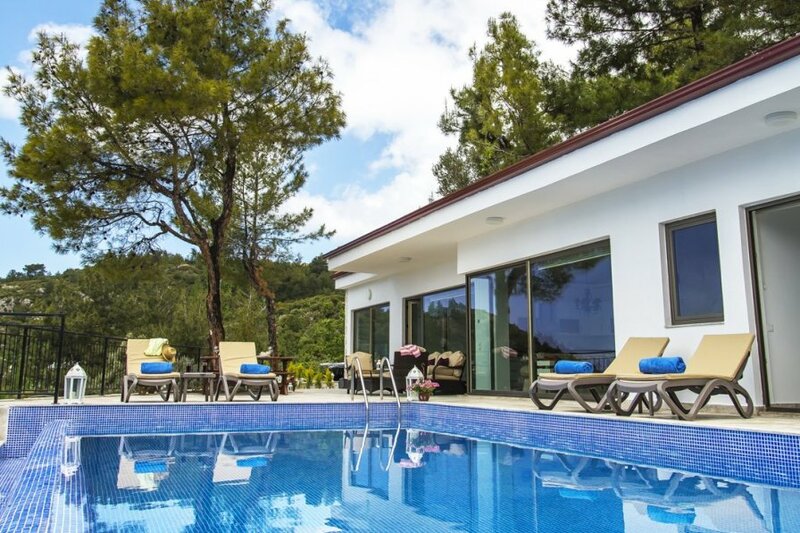 The villa itself is located in rural and peaceful Islamlar Village in the foothills of the Taurus Mountains. This quiet village is 9km from central Kalkan, and it's a short three-minute walk to the village's local restaurants and shops. There you can get a real insight into traditional rural Turkish life. Explore the olive groves and vineyards or head to a trout farm restaurant – the most popular cuisine in the area – with locally-sourced ingredients and beautiful views down the valley. Koy Manzara is also close to parts of the famous Lycian Way – it's a spectacular walking route that has breath-taking views over the coast from above Kas and Kalkan and takes you to remote, unspoilt places like the 12km long beach at Patara or the castle, harbour and ruins at Ucagiz. Depending on what you like, you can join the trail for a short 30-minute stroll or a more strenuous day walk. There are plenty of swimming beaches around the area including Kaputas Beach and Patara Beach. You can take part in water sports or head out on a traditional wooden gullet (sailing boat) to experience the full beauty of the coast, with time for a swim or snorkel. For a cultural day trip instead, you could visit the sunken remains at Kekova or Simena's Ottoman Castle. Further afield, there's also the preserved Kayakoy ghost village with deserted, Greek-style houses and churches.